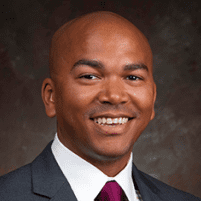 Thomas Jones II, MD, is a board-certified, fellowship-trained orthopedic surgeon who specializes in minimally invasive spine surgery. At The Spine Institute of Southeast Texas, his top-rated practice with locations in Pearland, Bellaire, and Lake Jackson, Texas, he provides comprehensive care for patients affected by acute or chronic spine conditions. With his innovative, patient-centered approach, Dr. Jones is dedicated to finding solutions that help his patients restore full functionality and return to a normal, pain-free life. Known for his conservative approach, Dr. Jones emphasizes proven, non-invasive treatment options whenever possible. When surgery is required, he uses minimally invasive techniques to achieve the best possible results and promote optimal recovery. After receiving his undergraduate degree from Morehouse College in Atlanta in 2000, Dr. Jones attended the University of Texas Medical Branch at Galveston, where he earned his medical degree in 2004. In 2009, he finished his residency training in orthopedic surgery at Memorial Hermann-Texas Medical Center, which is the primary teaching hospital for the University of Texas Health Science Center at Houston. In 2010, Dr. Jones went on to complete his fellowship training in spinal surgery at the Texas Back Institute in Dallas. Dr. Jones is committed to providing personalized, high-quality care based on the philosophy that patient education and participation are essential components of long-term treatment success. Whether you’re living with chronic unexplained back pain or a degenerative spine condition, Dr. Jones can help you find lasting pain relief and get you back on your feet.